Girls Track opens up the 2019 season! 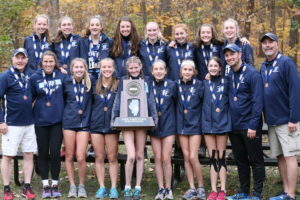 The DGS girls track & field team opened up the 2019 season in exciting fashion on Saturday at Hinsdale Central. The Mustangs took on the host Red Devils as well as defending state champion Naperville North, Proviso East, and Chicago Westinghouse. 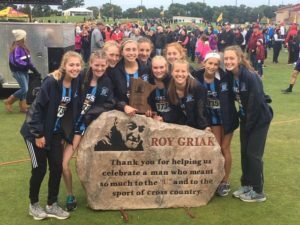 The meet was not scored, but that didn’t stop DGS from flexing some early season muscles. On the varsity level, the Mustangs were led by a trio of juniors. Ariel Johnson won both the long jump (15-10.5) and the triple jump (33-9.5). Johnson also ran a leg on the winning 4x160m relay team (1:29.3) that included seniors Lauren Hodge, Gianna Lucacik, and Clarice Maes. The 800m run was won by Erin Reidy in a fast 2:18.2 time. Reidy also anchored the first place 4x400m relay team (4:21.5) that included seniors Becky Versaskas, Olivia Duax, and Alisha Macas. Junior, Maddie Pucillo won the pole vault with a height of 7-0. Lily Dempsey (Sr) also cleared 7-0 to finish in 2nd place. In the varsity field events, Alyssa Gawron (Sr) placed 3rd in the shot put with a throw of 26-3 and Alexa Flores (Sr) placed 5th (21-8). JaTaeja Herring (Sr) placed 4th in the triple jump with a jump of 28-0. Senior, Clarice Maes led a strong showing by the DGS sprinters with her 2nd place finish in the 300m (45.14). Maddie Puccillo (Jr) and Gianna Lucacik (Sr) placed 2nd and 3rd respectively in the 55m hurdles (10.64 & 10.74). Lauren Hodge (Sr) finished 3rd in the 55m dash with a time of 7.84. The DGS distance crew ran some great 1600m times led by junior, Kennedy Warden’s 3rd place finish (5:16.9). Four other Mustangs all finished within 4 seconds of each other with Becky Versaskas (Sr) running 5:22.6, Olivia Duax (Sr) 5:23.1, Melissa Weidner (Sr) 5:26.1, and Rebecca Diddia (So) 5:26.5. In the Frosh/Soph competition, the Mustangs had one double winner. Aamari Taylor (So) won both the long jump (14-8.5) and the high jump (4-6). Josephine Brobby (So) won the 200m dash (30.54) placed 3rd in the 55m dash (8.04). Both Taylor and Brobby ran legs on the 2nd place 4x160m relay team (1:39.5) along with Dorota Wulw (So) and Gianna Villareal (Fr). In the shot put, freshman, Natalie Olson took 1st place with a throw of 24-10. Nora Coonrod (Fr) took 4th place in the 55m hurdles. Freshmen distance runners swept the top 2 places in both the 800m and 1600m races. Kelsey Casella (Fr) won the 800m (2:32.1) with Renee Kowalski (Fr) close behind in 2nd place (2:34.4). Alex Spang (Fr) and Sophia McNerney (Fr) went 1-2 in the 1600m with 5:37.4 and 5:37.6 respectively. Madison Wies (So) and Gretchen Scheck (Fr) placed 4th and 5th in the 800m. The F/S 4x400m relay team (Kelsey Casella, Maya Scheck, Renee Kowalski, and Alex Spang) finished off the day with a victory in 4:48.4. Individual DGS results and splits can be found HERE. The Mustangs will compete again at 9:00am on Saturday, February 16th in a home meet vs. Benet, St.Ignatius, and Westmont. Author Coach PlunkettPosted on February 10, 2019 Categories Track & FieldLeave a comment on Girls Track opens up the 2019 season!